(l-r) The front and back labels of an import. Check the back label for the importer’s name. 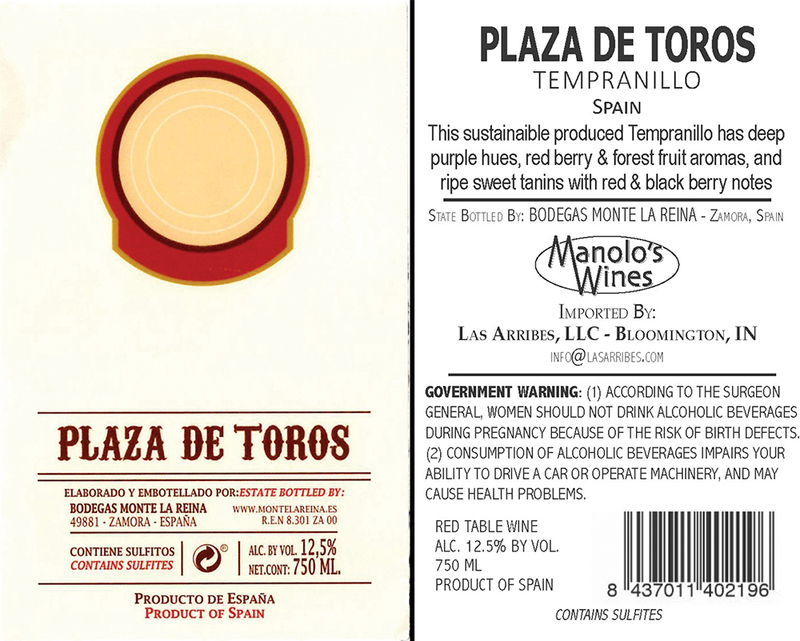 This wine comes from a trustworthy Bloomington importer, Manolo’s Wines. Imagine walking into a wine store and immediately finding the perfect wine for an occasion. It’s a nice fantasy but, for most of us, not likely to happen. Even the experienced wine buyer can have problems searching the shelves. Wine selection is often a crapshoot. Of course, in a wine store, the staff can be helpful, but in a big-box or grocery store, it may not be possible to find help. I’ve had inexperienced wine buyers, especially first-timers, tell me they go in with a vague idea of what they want—a cabernet, chardonnay, merlot, what have you—but are clueless about wine quality or value. So, they shop by label. They judge the wine by the pretty artwork on the front label or the written description on the back. Those front labels, with famous works of art, or works commissioned by the winery, are enticing. And those back labels are full of information about the winery and how it works hard to make a great bottle of wine. Oh, the wonderful flavors of “dark fruits” (?) and smoke that await us in the bottle. I detect some smoke all right, but it’s coming from the writers. We all share common tastes: salty, sour, bitter, sweet, and umami (a deep, savory flavor), but each of us also carries a unique palate. It’s a bit like my colorblindness. The colors are all there, but what I see differs slightly from that of someone with perfect color vision. In a tasting, I often find I experience different flavors than those around me, and detect nuances they do not. So, how can any of this knowledge be used to select wine? One strategy is obvious. If you have tasted a producer’s wine, you know most of what you need to know. Its style and flavor aren’t likely to change much from year to year. It’s in the producer’s self-interest, and is a selling point, to keep its wine’s concentration and flavor profile consistent. So, if you like it, buy it again; otherwise move on. A second way to select wine is to turn the bottle around and look at the importer’s name. Several well-known importers make it their business to find little-known or unknown producers and bring them to the marketplace. They have long-established reputations for quality, and their name on the bottle can add confidence to the purchase. Leonardo LoCascio (The Winebow Group) has a long history of importing quality Italian wines to the United States. Eric Solomon (European Cellars/Eric Solomon Selections) is known for his Spanish and French imports. Jorge Ordoñez (Jorge Ordoñez Selections) is both a producer and importer of quality Spanish wines. And Robert Kacher (Robert Kacher Selections) is an importer with a portfolio of small, French, family-run estates. Locally, Manolo’s Wines is an importer of small, family-owned wineries in central Spain. One of their names on the bottle isn’t an absolute guarantee you will like the wine, but, in the absence of other knowledge, it’s a very good first step. And I’ll drink to that. I love what you said it so succinctly. If you love it, get it. if you don’t, don’t buy the wine. Wine preference really has been found on the course of many wine tastings. It will require some patience, but lots of wine along the way. Thanks for the tips!